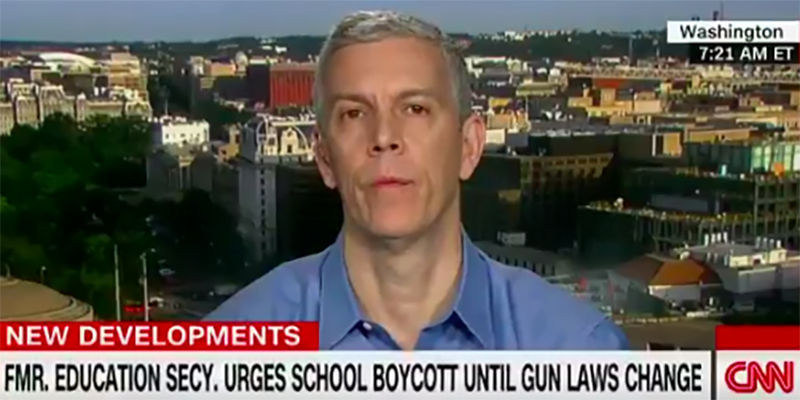 Former education secretary Arne Duncan is making media waves touting an unorthodox proposal to end gun violence in schools: taking children out of class. Speaking on CNN’s New Day on Monday, Duncan maintained that a “provocative measure” like a school boycott is needed amid the country’s seemingly stagnant response to school shootings — the latest at a Santa Fe, Texas, high school Friday that left eight students and two teachers dead and 13 others injured. “We as parents have failed to keep our kids safe,” former Education Secretary Arne Duncan says. “We as parents have failed to keep our kids safe, and we need to create a tension,” said Duncan, who has school-age children. A good time for the movement, he noted, would be when many schools traditionally start classes after the Labor Day holiday. Duncan first retweeted the idea — piggybacking off of Education Post executive director Peter Cunningham, who worked under Duncan in the Obama administration — hours after Friday’s shooting, calling the strike proposal “brilliant, and tragically necessary.” Duncan was education secretary from 2009 to 2015, and he acts as managing partner of Chicago Cred, an organization working to curb gun violence in the city. He’s also active on social media, retweeting activists and Parkland, Florida, shooting survivors David Hogg and Emma González as they call for increased youth voter registration. Duncan was not available Monday for comment. Cunningham, who called his former boss an “outstanding, long-standing proponent“ for gun reform, told The 74 he was inspired to circulate the idea because he believes parents can have sizable clout as contentious political races approach. Secretary of Education Betsy DeVos has not weighed in publicly on the proposal, but after Friday’s tragedy she affirmed in a written statement that the recently created Federal Commission on School Safety is “working to identify proven ways to prevent violence and keep our students safe.” She’d met with past school shooting victims and their families the day before. Many social media users have enthusiastically embraced the prospect of a strike, including education leaders such as Teach for America founder Wendy Kopp and American Federation of Teachers President Randi Weingarten. Others have offered hesitant optimism, pointing to possible truancy or the financial burden a boycott could place on families who work.
. I am all in on large scale protests – I am concerned that this would hurt local teachers&administrators& staff who love&work so hard for our kids instead of making the point to pp who seem bought&paid for – what do some of our local ed leaders think? Sounds brilliant unless you are the single parent who has to work as others have said. That’s where the village should stand in to assist the single parents. Sign me up for the village.